Andrew Zimmern posed with Nudo House staff in one of many restaurant visits in St. Louis this week. 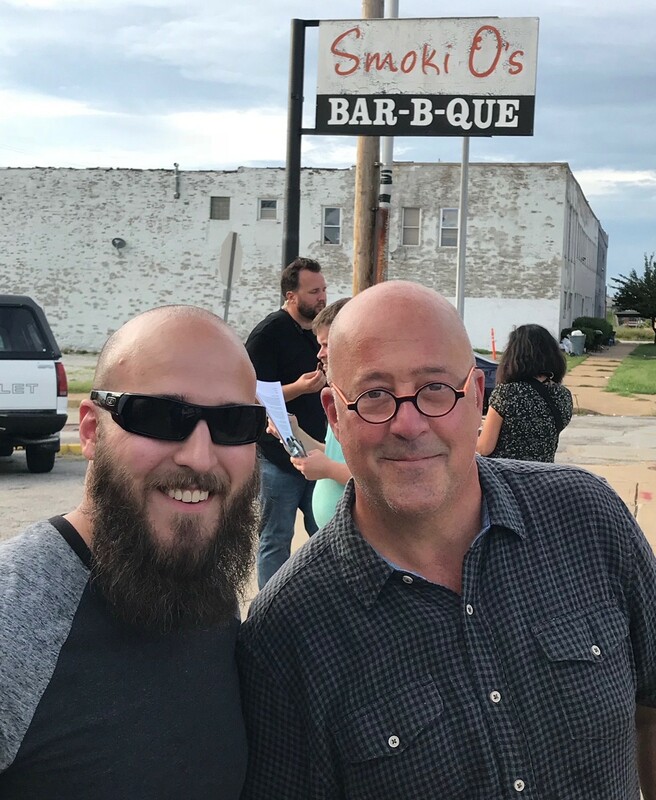 Between tweets excoriating Donald Trump, Bizarre Foods star Andrew Zimmern spent the last two days exploring St. Louis restaurants — and the chef and Travel Channel personality left huge smiles everywhere he went. The chef was reportedly scouting locations for an episode — and really, isn't it about time? The St. Louis episode of Bizarre Foods: Delicious Destinations premiered well over three years ago; a lot of good places have opened in that time. 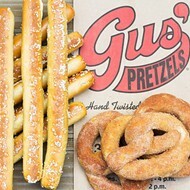 And Zimmern, to his credit, wasted no time exploring, visiting both old favorites and some new hotspots. 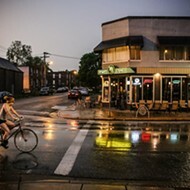 The social media trail began on Wednesday, when Zimmern tweeted enthusiastically about the granddaddy of the city's new wave barbecue scene, Pappy's Smokehouse (3106 Olive Street, 314-535-4340). "Burnt ends, ribs, fried corn, spicy green beans, potato salad and a ruthless slaw. I love @pappyssmokehouse." And while that was surely a filling dinner, by the next day, Zimmern was hungry again. He showed up Grace Meat + Three (4270 Manchester Avenue, 314-533-2700) for lunch. The country-style fast-casual spot in the Grove posted a photo, saying, "It was a blast having y’all here! And thank you to our guests for your attendance we truly have the best industry family around!" From there, Zimmern headed to Gioia's Deli (1934 Macklind Avenue, 314-776-9410), which famously has 600-plus pounds of extra beef on its hands after this week's LouFest cancellation. Zimmern apparently did his bit to drive traffic to the Hill location ... or maybe just take down a hot salami sandwich. And after that, the celebrity chef/eater surfaced at Nudo House (11423 Olive Boulevard, Creve Coeur; 314-274-8046). "THANK YOU @chefaz for hanging with the #NudoSquad today! Humbled and honored to share our food and family with you," the restaurant posted on Instagram. Andrew Zimmern visited the landmark Smoki O's. Believe it or not, though, the insatiable Zimmern still wasn't done. An evening post from Pastaria (7734 Forsyth Blvd, Clayton; 314-862-6603) suggested he finished his night with dinner there, posing for photos with its James Beard award-winning chef/owner Gerard Craft. "Thank you for dining with us, Andrew Zimmern," Pastaria wrote on Facebook. "Hope you enjoyed your visit to STL." And hey! By the looks of things, he totally did. "Thank you St. Louis," Zimmern posted on Twitter this morning, tearing himself away from national politics long enough to post a lovely photo of the St. Louis sunrise. "Love this town and love the people even more." Editor's note: We updated this post after publication to include a photo and details about Zimmern's trip to Smoki O's.